Opium production in Afghanistan has “grown fortyfold” in the 13 years of US Operation Enduring Freedom, according to the head of the Russian Security Council. The intervention has “exacerbated existing problems,” rather than solved them. “Unfortunately, the failed policy of Washington did not solve, but on the contrary exacerbated, the existing problems,” Nikolai Patrushev has said while addressing the heads of the Shanghai Cooperation Organization Security Council. At the same time, the aims of introducing foreign military to Afghanistan, including the destruction of Al-Qaeda and Taliban, were not accomplished, he added. According to Patrushev, Afghan extremists’ organizations benefit from lax law enforcement and use their positions in northern Afghanistan to enter neighboring countries in Central Asia. He stressed that the situation in Afghanistan is one of the crucial factors in building stability in the Central Asian region. In the meantime, opium production has been on the rise in Afghanistan over recent years despite US counter-narcotics efforts. It was previously reported that since the US toppled the Taliban in 2002, opium production in the country has tripled. 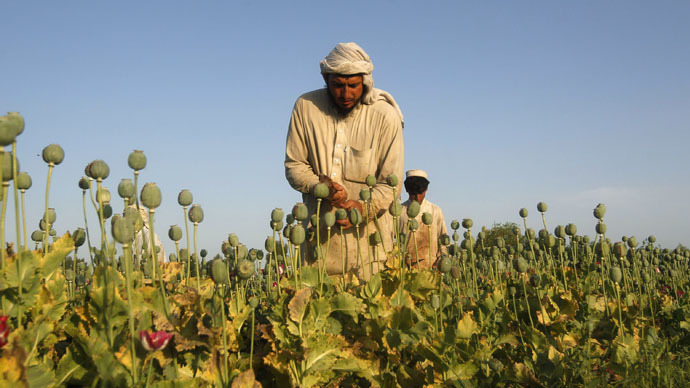 Afghanistan remains a homeland for the largest opium poppy production and distribution network in the world, supplying more than 90 percent of the global crop. The United Nations says opium cultivation in Afghanistan increased by 7 percent in 2014, hitting a record high despite costly US led efforts to battle the production. Earlier the head of the Russian Federal Drug Control Service, Viktor Ivanov, said the area of poppy plantation is growing. He has called for this problem to be addressed on the UN level as it represents a threat not only to Russia but to the European security. "The transit of heroin from Afghanistan though the Islamic State-controlled territory is huge financial sponsorship. According to our estimates, the IS makes up to $1 billion on Afghan heroin trafficked through its territory," Ivanov said. The International Narcotic Control Board says Heroin trafficking from Afghanistan has increased the consumption of opiate drugs in East European countries to levels higher than the world average. Operation Enduring Freedom lasted for over 13 years and officially ended in December 2014. Currently thousands of NATO troops are still in Afghanistan as part of a peacekeeping mission.